~Schulz Sightings~: Piper: "Adoption: The Heart of the Gospel"
John Piper, one of my favorites, gives this sermon at an adoption conference. It makes me refocus, take a step back, and look at the huge, grande scale of my adoption as Christ's child. Earthly adoption is the perfect picture, horizontally, of my redemption by him, vertically. What a joy to be able to take part in that!! Now that the holidays are over, I am excited to get my home study back, completed, and apply to US immigration for approval to adopt internationally. We'll do that next week. My wonderful new friend, Jamie Jo, is guiding me all along the way. She sends me lists of things to do and collect, formatted letters, exact forms to fill out. She has already given me tons of advice for travel, hotels, customs, and transition bringing him home. I am so thankful for her!! She just adopted her 2nd from Rwanda a couple weeks ago, a darling 6 year old boy, Tiki. Braner party of 7 blog to the left. 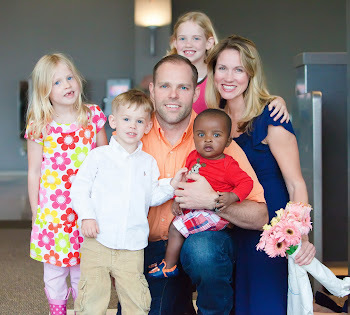 We're Marc and Kayan (and Adalae) and are adopting from Rwanda and live in Austin too! I think you and the Spies are the only families we know who are adopting from Rwanda from Austin. I'd love to touch base with you as we go through this journey. Our dossier has been over in Rwanda since 10-29 so I guess we are almost 4 months DTR.